Persuna li ma tistħix ngħidulha li jkollha wiċċ bla żejt. Taġixxi b’mod sfaċċat, qiesu ma ġara xejn. Bħall-membru parlamentari tal-PN David Agius. 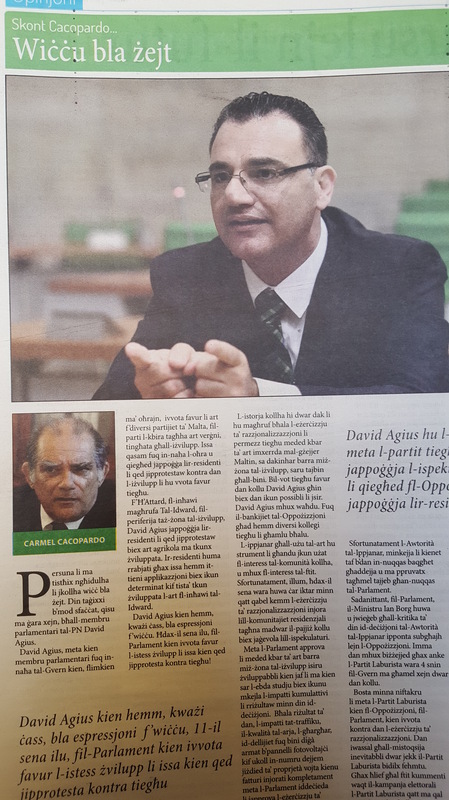 David Agius, meta kien membru parlamentari fuq in-naħa tal-Gvern kien, flimkien ma oħrajn, ivvota favur li art f’diversi partijiet ta’ Malta, fil-parti l-kbira tagħha art verġni, tingħata għall-iżvilupp. Issa qasam fuq in-naħa l-oħra u qiegħed jappoġġa lir-residenti li qed jipprotestaw kontra dan l-iżvilupp li hu ivvota favur tiegħu. F’Ħ’Attard, fl-inħawi magħrufa Tal-Idward, fil-periferija taż-żona tal-iżvilupp, David Agius jappoġġa lir-residenti li qed jipprotestaw biex art agrikola ma tkunx żviluppata. Ir-residenti huma rrabjati għax issa hemm it-tieni applikazzjoni biex ikun determinat kif tista’ tkun żviluppata l-art fl-inħawi tal-Idward. David Agius kien hemm, kważi ċass, bla espressjoni f’wiċċu. Ħdax-il sena ilu, fil-Parlament kien ivvota favur l-istess żvilupp li issa kien qed jipprotesta kontra tiegħu! L-istorja kollha hi dwar dak li hu magħruf bħala l-eżerċizzju ta’ razzjonalizzazzjoni li permezz tiegħu meded kbar ta’ art imxerrda mal-gżejjer Maltin, sa dakinnhar barra miż-żona tal-iżvilupp, saru tajbin għall-bini. Bil-vot tiegħu favur dan kollu David Agius għin biex dan ikun possibli li jsir. David Agius mhux waħdu. Fuq il-bankijiet tal-Opposizzjoni għad hemm diversi kollegi tiegħu li għamlu bħalu. L-ippjanar għall-użu tal-art hu strument li għandu jkun użat fl-interess tal-komunitá kollha, u mhux fl-interess tal-ftit. Sfortunatament, illum, ħdax-il sena wara huwa ċar iktar minn qatt qabel kemm l-eżerċzzju ta’ razzjonalizzazzjoni injora lill-komunitajiet residenzjali tagħna madwar il-pajjiż kollu biex jaġevola lill-ispekulaturi. Meta l-Parlament approva li meded kbar ta’ art barra miż-żona tal-iżvilupp isiru żviluppabbli kien jaf li ma kien sar l-ebda studju biex ikunu mkejla l-impatti kumulattivi li rriżultaw minn din id-deċiżjoni. Bħala riżultat ta’ dan, l-impatti tat-traffiku, l-kwalitá tal-arja, l-għargħar, id-dellijiet fuq bini diġa armat b’pannelli fotovoltajċi kif ukoll in-numru dejjem jiżdied ta’ propjetá vojta kienu fatturi injorati kompletament meta l-Parlament iddeċieda li japprova l-eżerċizzju ta’ razzjonalizzazzjoni. Sfortunatament, l-Awtoritá tal-Ippjanar, minkejja li kienet taf b’dan in-nuqqas baqgħet għaddejja u ma ppruvatx tagħmel tajjeb għan-nuqqas tal-Parlament. Sadanittant, fil-Parlament, il-Ministru Ian Borg huwa u jwieġeb għall-kritika ta’ din id-deċiżjoni tal-Awtoritá tal-Ippjanar ipponta subgħajh lejn l-Opposizzjoni. Imma dan mhux biżżejjed għax anke l-Partit Laburista wara 4 snin fil-Gvern ma għamel xejn dwar dan kollu. Bosta minna niftakru li meta l-Partit Laburista kien fl-Opposizzjoni, fil-Parlament, kien ivvota kontra dan l-eserċizzju ta’ razzjonalizzazzjoni. Dan iwassal għall-mistoqsija inevitabbli dwar jekk il-Partit Laburista bidilx fehmtu. Għax ħlief għal ftit kummenti waqt il-kampanja elettorali l-Partit Laburista qatt ma qal xejn dwar dan kollu. Dan x’jfisser? Għandna ninterpretaw in-nuqqas ta’ azzjoni mill-Partit Laburista fil-Gvern bħala qbil mal-ezerċizzju ta’ razzjonalizzazzjoni? Sa fejn naf jiena, Alternattiva Demokratika biss indirizzat dan kollu waqt il-kampanja elettorali li għadha kif intemmet. Dan billi pproponiet li dawn it-tip ta’ permessi m’għandhomx joħorġu f’dawk il-lokalitajiet fejn hemm numru konsiderevoli ta’ propjetajiet residenzjali vakanti. Jidher imma li l-partiti fil-parlament issa bidlu ir-rwol tagħhom. David Agius hu l-eżempju ovvju: meta l-partit tiegħu kien fil-Gvern jappoġġa l-ispekulazzjoni, u issa li qiegħed fl-Opposizzjoni taparsi jappoġġa lir-residenti. David was always into sport – primarily basketball, if I remember correctly. He has, however, now dedicated considerable time to the practice of mental gymnastics. In Attard, in the area known as Tal-Idward – which is just outside the development zone – David has time and again publicly manifested his support of the residents’ cause: opposition to the development of agricultural land. The residents have now vented their anger in a pubic protest against a second planning control application that seeks to identify what would be permissible development in the tal-Idward area at Attard, the first application having been turned down around three years ago. David Agius, the Opposition Whip, stood there, with a poker face, not batting an eyelid. Eleven years ago, in Parliament, he voted in favour of permitting the same development against which he is now demonstrating! The issue is the so-called “rationalisation exercise” as a result of which considerable tracts of ODZ land all over the Maltese islands will henceforth to be considered as developable land. In 2006, with his favourable vote in Parliament, David Agius, contributed to making this possible. On the Opposition benches, he is accompanied by a number of other MPs who likewise voted in favour of more virgin agricultural land being given up for development. Land-use planning should keep in mind the interests of the whole community and not only the interests of a select few. Unfortunately, eleven years down the line, it is now more clear than ever that the rationalisation exercise has completely ignored the interests of the residential communities all over the islands in order to satisfy the greed of land speculators. When Parliament considered the approval of removing ODZ status of large tracts of land, primarily (but not exclusively) agricultural land, it did so in full knowledge of the fact that the cumulative impacts of such a decision had not been assessed. Such an assessment, which is prescribed in the Strategic Environment Assessment Directive of the EU, would have been mandatory had Parliament’s decision been taken some days later than it actually was. As a result, traffic impacts, air quality, flooding, the shadowing of existing residential property equipped with photo-voltaic panels and the issue of an ever increasing stock of vacant properties were completely ignored when Parliament approved the rationalisation exercise. The Planning Authority, unfortunately, notwithstanding that it is aware of the shortcomings underpinning the rationalisation exercise, has failed to take steps to mitigate these shortcomings apart from minor cosmetic changes to the proposals submitted on behalf of speculators. In Parliament Minister Ian Borg rightly pointed his fingers at the Opposition when replying to criticism of the above-mentioned Planning Authority’s decision. Blaming the Opposition is however not enough as the Labour Party had sufficient time to act on the matter in the past four years, but has not done so. Most of us remember that the Labour Party itself, when in Opposition, had voted against the rationalisation exercise in Parliament. This leads to the inevitable question as to whether or not Labour has since changed its mind as – with the exception of a few sympathetic comments on the eve of the June general election – it has never committed itself to changes to the rationalisation exercise. Are we to interpret the Labour Party’s non-action as a change of political position, signifying agreement with the rationalisation exercise in the form approved by Parliament in 2006? As far as I am aware, Alternattiva Demokratika, the Green Party, is the only political party to propose a specific measure on changes to the rationalisation exercise. This was done once more during the recent electoral campaign. Such a measure proposed by Alternattiva Demokratika is linked to the large number of vacant properties, which should be a break applied by land-use planning regulators in order not to develop more land unnecessarily. But is seems that the Labour Party and the PN have switched roles. Hence David’s mental gymnastics: supporting speculators when in government, supporting residents when in opposition. 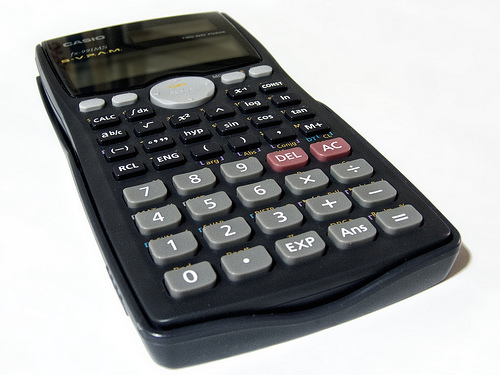 Political calculation or environmental principle? Joseph Muscat’s declaration that the Freeport Terminal will not be permitted to expand in Birżebbuġa’s direction due to its impacts on the residential community will inevitably have an effect on the Planning Authority. Viewed in the context of the recent Planning Authority decision not to approve the proposed Ħondoq ir-Rummien development, a pattern seems to be developing. Given the fact that these two decisions are closely associated with localities that politically support the Labour Party it is still not clear whether this newly discovered sensitivity to restrict development which negatively impacts residential communities is based on political calculation or on environmental principle. 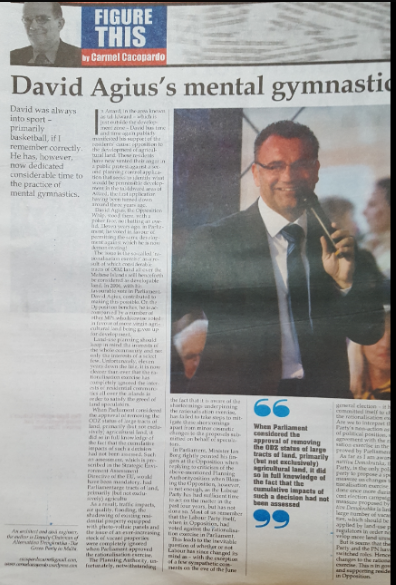 This consideration is inevitable, in particular due to the report in this newspaper on 22 June that the Prime Minister had stated, in a discussion with environmental NGO Flimkien għall-Ambjent Aħjar, that he does not care about impact assessments, as residents get used to everything. As far as I am aware, the Office of the Prime Minister never corrected this report. The Freeport Terminal debate clearly indicates that Birżebbuġa residents are determined to deliver a different message: they have had enough. During the last seven years there has been an ongoing tug-of-war between Birżebbuġa Local Council, MEPA and the Freeport Terminal Management. This has led to a number of improvements, the most important of which was the setting up of a tripartite Environmental Monitoring Committee that has served to build some bridges and to explore solutions to existing problems caused by the operation of the Freeport Terminal. There was a time, around two years ago, when pressure was put on Birżebbuġa Local Council to drop its objections to specific operations. I distinctly remember representatives from the oil-rig repair industry trying to convince the Council of the “benefits” that an oil-rig industry based at the Freeport Terminal could generate. When these representatives realised that no one was convinced, an amendment to the environmental permit was forced through the then MEPA Board. To their credit, only three of the then board members understood the real issues and voted against the proposal: the two MPs (Joe Sammut and Ryan Callus) and the environmental NGO representative Alex Vella of the Ramblers Association. The amended environmental permit would have permitted minor repairs to ships and oil-rigs berthed at the Freeport Terminal. However, after the MEPA Board meeting all hell broke loose, leading Prime Minister Joseph Muscat to disassociate himself from its decision and publicly align himself with the minority on the board opposing the changes. He then stated that he was in agreement with “his representative”, Labour MP Joe Sammut. While the Freeport Terminal, faced with the reaction of residents, eventually relinquished the newly-acquired permit, the internal debate within the Labour Party continued, leading to the recent statement by Joseph Muscat that he is not in agreement with an expansion of the Freeport Terminal operations that would have a negative impact on the Birżebbuġa community. Irrespective of whether it is a matter of principle or a political calculation which has led the Prime Minister to make such a statement, I submit that this is still a significant turning point that has been achieved as a direct result of Birżebbuġa Local Council’s persistent lobbying. It contrasts with the position taken by the Leader of the Opposition, who looks forward to an increase in the operations of the Freeport Terminal, without batting an eyelid over the resulting, continuously increasing, impact on the residential community. The Prime Minister’s statement, while being a positive first step, is certainly not enough. It needs to be translated into policy as an integral part of the revised Local Plans currently under consideration. It is also important that the Prime Minister’s newly identified sensitivities are exported to other areas in Malta and Gozo. It is essential that, in a small country such as ours, third party rights opposing “development” are reinforced. The issue at stake is far larger than Birżebbbuġa or the Freeport Terminal. It is a tug-of-war between those supporting “development” at all costs and our residential communities. The government must, through planning policy, be supportive of all our residential communities without exception.